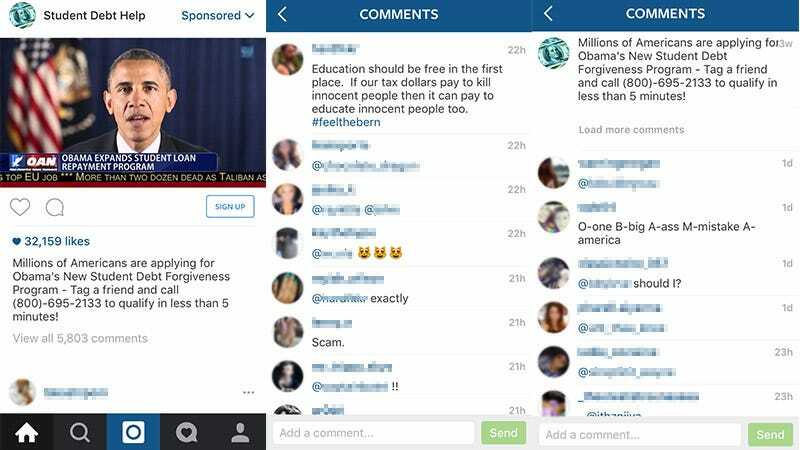 Yesterday on my Instagram feed, nestled between an old college friend’s Belgian waffle breakfast and a post from a Japanese experimental artist, was a sponsored post claiming “Millions of Americans are applying for Obama’s New Student Debt Forgiveness Program” and promising I could qualify in less than five minutes if I tagged a friend and called a toll-free number. The post had a picture of President Obama (a screengrab apparently from San Diego’s One America News) and 32,159 likes. The phone number is in no way affiliated with any government program. Instead, it appears to be a convoluted debt forgiveness company that charges you for something you can actually do for free. It will also, probably, sell your personal data and sign you up for a lifetime of junk mail and robocalls. The worrying thing is that this made it onto Instagram at all. It pops up right under your thumb as you scroll through photos, and preys on potentially vulnerable, unsuspecting people. When we contacted Instagram about the ad, they said they reevaluated it, removed it, and disabled the account. That doesn’t seem to be the case. Even after rebooting the app, Student Debt Help’s ad still appears in my timeline (with another 1,500 likes) and the associated Facebook page is still up. So what is this company and what are they selling? The Student Debt Help Instagram post itself doesn’t point to any sort of profile page, but a search for the phone number brings you to stuhelp123.com. The company, which claims to be based at an address in Indiana, again displays a huge photo of the President and gives you that same number to call: no About section, no means to contact the business owners, not even annoying buttons to follow stuhelp123 on social media. Marketing Partners may contact me by telephone (including at my wireless telephone number), email, SMS, or pre-recorded message...and I understand and agree that this consent applies even if my number is listed on a state or federal do-not-call list. Now, about that address in Indiana. Not only does Google Maps have no listing at that specific address (Bear Town, Indiana doesn’t appear to be a real place), it’s also the address used by a company called TeleSuit, which specializes in ending harassment by telemarketers. Huh. Calling the 800 number, I was greeted by a cheery sounding woman who stated her business’s name as U.S. Student Loan Center. So now we’re at three companies, all of which coincidentally are student loan businesses. Though she admitted USSLC worked with a number of other companies, she seemed to have no knowledge of these ghoulish terms of service, and stated that her company had an internal “do-not-call” list for customers who didn’t want to received promotional calls, texts, and mail. Despite reaching USSLC through the phone number on the ad, their site lists a different number entirely. But its unclear if using one service makes the rules of the others applicable—and if not, why they would all share a phone number. As for what they’re selling, it’s certainly not immediate debt forgiveness. Many companies exist which will apply on your behalf for student loan consolidation or rehabilitation. What many of them don’t tell you is that you need to meet certain criteria, and that applying for this sort of relief through Department of Education is free. Deceptive practices in Instagram advertising have been reported in the past— like Lord and Taylor’s back-alley attempt at native advertising—but this seems to have gone through Facebook’s due process and still been allowed to display on peoples’ timelines. We’ve reached out to StudentDebtNational and USSLC for comment. The email for SDN appears to be an invalid address.